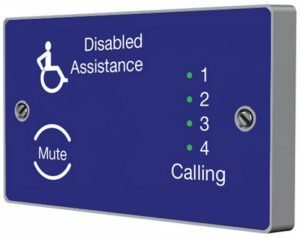 The CFEASL4 4 way splitter unit allows up to four stand alone, disabled toilets to be monitored in one specific area. Staff can react to an alarm swiftly and efficiently at the designated area, such as a reception or security desk. The emergency assist power supply unit (PSU) is designed to power the 4 way splitter. When using the 4 way splitter, each disabled toilet does not need its own PSU as each toilet is powered by the 4 way splitter.